The large wooden troll, "Isak Hearthstone," made by artist Thomas Dambo during Breckenridge International Festival of the Arts in August, sits in the snow Wednesday, Nov. 14, along the Wellington Trail in Breckenridge. Citing public safety concerns, Breckenridge Town Council is ready to say goodbye to Isak Heartsone, an art installation that’s been a runaway success with visitors, but whose popularity has also rankled residents living nearby. 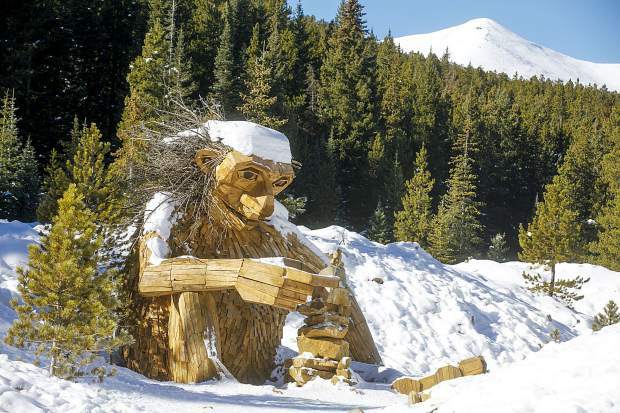 The 15-foot wood troll sits about a mile up the Wellington Trail in Breckenridge, built there for a summer arts festival that ended in August. The original plan was to leave the troll in place as long he could withstand the elements and wasn’t vandalized. Enough town council members were ready to cut the troll’s lifespan short on Tuesday, however, that he’ll soon be coming down. Exactly when it might happen was not announced at Tuesday’s council meeting. Since the festival, the troll has been drawing large crowds, and the throngs of troll-seekers have caused numerous problems for some of the nearby homeowners, who’ve been dealing with illegal parking, littering and a severe a loss of privacy since the troll came to life, among other issues. After some of those homeowners voiced their complaints, council had decided to keep the troll through the winter and reevalute the situation in the spring with hope that some of these issues would subside with mitigation efforts and colder temperatures. That hasn’t happened, though, said Councilman Jeffrey Bergeron, who originally supported keeping the troll but has visited the site on multiple occasions and said he witnessed some of the safety hazards himself. “I might, at this point, feel comfortable rolling over on Isak,” Bergeron said Tuesday. The decision to remove the troll wasn’t unanimous, but the two biggest supporters, councilwomen Elisabeth Lawrence and Wendy Wolfe, both said they weren’t ready to “fall on a sword” to keep the troll. Lawrence also didn’t want to announce any definitive date for removing the troll because, she worried, doing so could ramp up the troll traffic until the sculpture can be removed.